A Professional Grade Single-Cup Headset with Boom Microphone and Fully Adjustable Listening Volume Control with Independent 6.35mm (1/4") Headphone and 5.25mm (0.206") Microphone Plugs. NOTE: Headset is ONLY compatible with Direct-Link Bridge or 007 Series System's Push-to-Talk Cables (not included). A Professional Grade Dual-Cup Noise-Canceling Headset with Boom Microphone and Fully Adjustable Listening Volume Controls with Independent 6.35mm (1/4") Headphone and 5.25mm (0.206") Micphone Plugs. NOTE: Headset is ONLY compatible with Direct-Link Bridge or 007 Series System's Push-to-Talk Cables (not included). 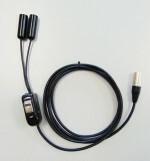 8 ft. (2.5m) Push-to-Talk Cable featuring 6.35mm (1/4") Headphone and 5.25mm (0.206") Jacks with Neutrik Connector. NOTE: Push-to-Talk Cable is ONLY compatible with the Direct-Link 007 Series System's Command Console. Single-Cup Negotiator Headset Kit; includes: A Professional Grade Single-Cup Headset with Boom Microphone and Fully Adjustable Listening Volume Control Delivered with an 8 ft. (2.5m) Push-to-Talk Cable featuring a Neutrik Plug. NOTE: Push-to-Talk Cable Included ONLY compatible with the Direct-Link 007 Series System. 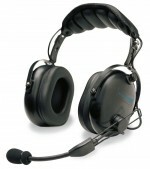 Dual-Cup Negotiator Headset Kit; includes: A Professional Grade Dual-Cup Noise-Canceling Headset with Boom Microphone and Fully Adjustable Listening Volume Controls Delivered with an 8 ft. (2.5m) Push-to-Talk Cable featuring a Neutrik Plug. NOTE: Push-to-Talk Cable Included ONLY compatible with the Direct-Link 007 Series System.